Eastern and Oriental Bhd (E&O) will be leveraging on its expertise and reputation as a lifestyle developer to undertake more upmarket projects outside its traditional markets of Kuala Lumpur and Penang. Deputy managing director Eric Chan says the group is ready to take the next step to move beyond its traditional markets and that includes venturing overseas. E&O's foray overseas will commence with the opening of an E&O Property Gallery and the first offshore Delicious cafe in Singapore in November. “We hope this step-by-step initiative will promote the E&O brand and its unique lifestyle experience to the regional and global market,” Chan told StarBizWeek in a recent interview. Through its range of lifestyle property and other related activities, he says E&O has set new industry benchmarks in terms of concept, quality, design, service and values. “We have two hotels, the Delicious chain of restaurants, a marina and a shopping mall to complement our property development initiatives to promote a unique lifestyle experience for our buyers,” Chan adds. In F&B, the Delicious Group is embarking on an expansion drive that will see the opening of more outlets, both locally and regionally. Presently it operates five Delicious cafes, a Reunion Chinese restaurant, a DISH steakhouse and a Delicious Ingredients gourmet grocer in the Klang Valley. The first Delicious cafe outside the Klang Valley was opened at Straits Quay festive retail mall in Penang early this month. A new Delicious cafe will be opened in Sunway Pyramid in August. It will also cross over the causeway in November when a Delicious cafe makes its debut in Singapore. Chan says E&O is also looking to expand its capacity in the hospitality sector by adding new rooms and service suites to its two existing hotel properties in Penang. E&O Hotel will have another 139 suites added to the existing 100 suites once the Victory Annexe block is completed next year. There will also be new facilities including retail outlets. Chan says it is a natural progression for E&O to leverage on its hospitality management expertise honed through the years to introduce the E&O Concierge Services that provide pay-on-demand concierge services, starting with the Suites at Straits Quay. E&O is also targeting to manage the serviced suites at St Mary Residences (if it clinches the management contract for the property), and its other future developments. Its ongoing property projects include the Seri Tanjung Pinang phase one in Penang that will take another three to five years to complete and St Mary Residences in Kuala Lumpur. 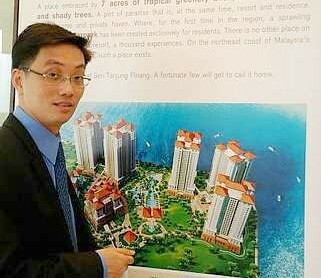 E&O's Seri Tanjung Pinang phase two is currently at the masterplanning stage. Among the Kuala Lumpur projects in the pipeline include condominiums at Jalan Yap Kwan Seng and Jalan Kia Peng, as well as the sale of prime bungalow plots in Damansara Heights. “Singaporeans make up about 30% to 50% of our total foreign sales, and there is also growing potential to be tapped from other emerging markets like buyers from China and India,” he adds. Chan attributes the strong foreign interest to the relatively lower Malaysian property prices compared with those in other regional markets such as Singapore, Hong Kong and Thailand. “Liquidity is ample and banks offer friendly financing. At the same time, Malaysian developers continue to innovate and offer quality products which are on par with international standards. Given the reasonable price levels, they present an attractive value proposition to property purchasers,” he explains. In particular, Chan is upbeat on the Kuala Lumpur and Penang property markets, with the ongoing public sector and infrastructure transformation plans for Greater KL which he says will draw investors and support the property market. “Kuala Lumpur and Penang are among the most liveable cities in Asia. They emerged in the 8th position in 2010 according to EAC International (an agency that rates living conditions in major cities for expatriates),” he points out. Citing figures from Malaysian Investment Development Authority, Chan says Penang's growing popularity among foreign investors, having emerged as the state with the highest inflow of foreign direct investment (FDI) totalling RM12bil last year, will give a boost to the property market. “Another RM7bil of FDI has been committed to be invested in the state which will generate a wave of expatriate workforce for the island within the next three years,” he adds. Other supporting factors include the ongoing improvements in Penang's key public infrastructure such as the international airport expansion project targeted for completion this year end, the construction of Penang's second bridge (by end 2013) as well as the enhanced connectivity to the state with more air flights into the island.